Spring is here in the Hagerstown MD area and all our attention turns to the warmer days and the curb appeal of our homes, commercial property, office, nonprofit and church grounds. Mulching offers many benefits to your property and the trees, flowers and shrubs in your landscaping beds. Contact Tom today at GroshsLawnService.com to schedule your landscaping mulching consultation here in Hagerstown MD and Washington County Maryland. 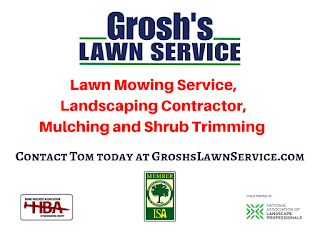 Take a few minutes and watch Grosh's Lawn Service YouTube video on Landscaping Mulching Hagerstown MD.